The Waverly Drive school zone on the afternoon of Jan. 23. In 2018, two southeast Albany residents asked the city council to get rid of this quarter-mile 20-mph zone, which is in effect from 7 a.m. to 5 p.m. on school days. They argued the zone was unnecessary considering the location — no school buildings nearby, a fence between the athletic fields and the street, nothing to obscure drivers’ sight lines, marked and signalized pedestrian crossings, and so forth. Johnny Scot Van Ras got a speeding ticket there at 9:13 a.m. on Oct. 11, a Thursday. In November he complained to the council. He also pleaded not-guilty to speeding, and at 11:15 a.m. Monday he goes to trial in Albany Municipal Court, on the ground floor at City Hall. In an email he wrote, “My position is that Waverly/SAHS is not a valid school zone because Oregon Department of Transportation states that ‘the school zone begins at the SCHOOL SPEED LIMIT sign and ends at the END SCHOOL SPEED LIMIT sign or END SCHOOL ZONE sign. '” Those zone-ending signs, he points out, are not there. Except for the school zone, the normal speed limit there is 40 mph. Van Ras’s ticket says he was going 39. In his email he asks that if a school zone is justified at all, it be designated with signs saying it’s in effect “when red lights flash.” “This would greatly aid the motorist,” he writes. 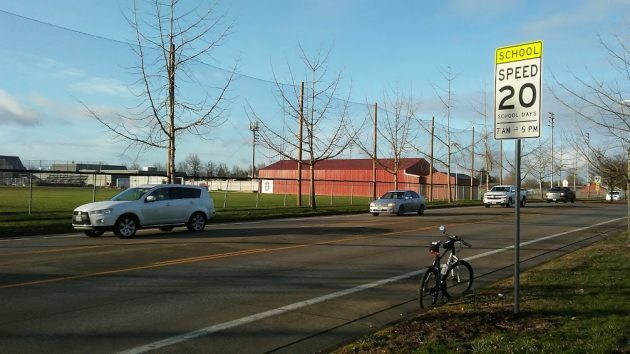 According to Van Ras, ODOT says school zones should be determined on the basis of an engineering study, which apparently was not done on this one. The council has asked for such a study, and city transportation systems analyst Ron Irish said Wednesday he was almost done with a draft, waiting only to get comments back from the school district. It should definitely be changed. Not school zone. Hazard is also created by Mennonite Village traffic that drives 15 mph. Could not agree more. The Gray Hairs piloting their massive sedans, weaving, dazed and confused. Seems if you’re “of a certain vintage,” the Coppers look the other way on S. Waverly wickedness. Speeding is thinking you won’t get caught. Think wrong and you may get a ticket, or worse, thrown into jail by government people who carry guns. Isn’t there a more progressive way than government exercising its power to punish us? Maybe government should instead provide incentives to help us slow down. Like free car repairs to owners of ugly old Saabs who drive like Richard Petty. Slow down, get your crappy Saab fixed. For progressives, there are more enlightened ways than punitive measures to change behavior. It’s working with early release programs in prisons. Why can’t we find something similar for drivers? The Chief, with Council imprimatur, should deploy a single radar-equipped squad car, preferably a rotation of unmarked, high-octane models to keep speeding scofflaws guessing. Between 7AM and 5PM, a dedicated officer’s sole duty would be to cite speeders in this cash-cow zone. And yes, given society’s penchant for carrying firearms as a regular course, this Waverly wealth generator will necessarily be armed. Only a fool would do otherwise. But the payoff is well worth it. The certain influx of cash into City coffers means the sky’s the limit when it comes to infrastructure improvement. Or we could be more civilized and just use manipulated cameras. Cause technology would never be wrong and the we would have no human to fight. But I hate to give progressives more ideas. Not trying to be inflammatory, just seeing information: Hasso, to your memory, or to that of any of your readers, has the city of Albany ever publicly admitted they were wrong about a traffic zone or anything else? The only thing that may come close to admitting wrongness was Jeff Christman convincing CARA to take “a breather” to reconsider their atrocious spending behavior. I was sorry to see Christman leave the council. If the Organ Grinder won’t tell you, ask the Monkey. The Mayor and past city councils have been utterly intolerant of ever being told they’re wrong. It is a form of narcissism rampant on issues that involve money and power. Witness the charter amendments we passed via initiative with big majorities giving Albany voters the final word on city debt and urban renewal plans. To this day, the Mayor, some current councilors and ex-councilors won’t admit they were wrong about what voters wanted – the last word. The most deluded politicians are those who choose to ignore what their constituents tell them. Welcome to Albany politics. I know it supremely galls you to realize that Albany is following the law – including the charter amendment. Deal with it.